The House Financial Services Committee plans to hold a series of "aggressive" hearings this year on how to reform the central bank. 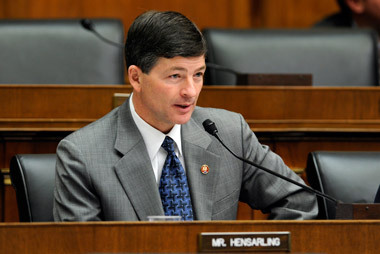 Hensarling said that “the economy’s subpar performance since the Federal Reserve embarked upon its stimulus more than five years ago” should encourage Yellen to lead the Fed “to adopt a more transparent and rules-based monetary policy that aims for price stability and long-term growth,” which he said Yellen “has spoken favorably about” in the past. The Federal Open Market Committee announced Dec. 18 that it would start reining in quantitative easing by instituting a “modest” $10 billion reduction in its monthly bond-buying program to $75 billion per month. Former Fed Chairman Ben Bernanke said during a press briefing after the FOMC announcement that further tapering would “be data dependent,” adding that he anticipated that the Fed would “probably do a measured reduction” at each meeting in 2014. The minutes from the December meeting will be released Wednesday. The FOMC’s first meeting of 2014 will be held Jan. 28 and 29, but a summary of economic projections and a press conference by Yellen won’t come until the meeting on March 19. Check out Washington Watchers See a Lull in Budget Wars on ThinkAdvisor.